Daniel Abdal-Hayy Moore is a Muslim poet who has published many poetry books and organized poetry reading festivals. 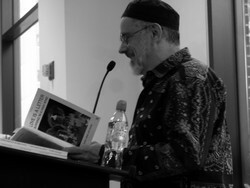 Born in 1940 in Oakland, California his first book of poems was published in 1964. He became a Muslim in 1970 and travelled extensively around Europe and North Africa. Although he stopped writing for ten years he continues writing Islamic and spiritual poetry. Please type '492' into this field.